Canvas, transferred from panel, 31 x 63. 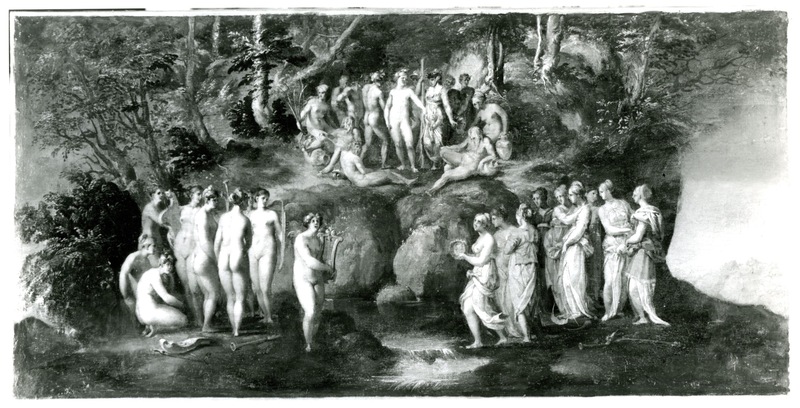 The tonality of the group of Muses at the lower left is brown and gray with some pink on the noses, cheeks, and soles of the feet. The center figure of this group, in profile, has a green and yellow headdress. The upper and central group of figures is much more reddish. The seated woman at the left holding three green palm fronds is seated on a patch of rose and orange drapery with two green dots. The figure to the left of Apollo has olive-green leaves in his hair. Apollo has blond hair possibly with a pink flower at the front. His quiver is dark orange. Minerva’s black helmet has a yellow scroll on top. Her garment is white at the chest, turquoise over her breasts, with a violet skirt with violet and red stripes across her left thigh. (The last female head of this group at the right is very beautifully painted and well preserved.) The first woman of the group of the clothed Pierides wears white with yellow changing to rose at the right. The second woman is dressed in yellow-ochre, followed by a woman in turquoise becoming rose-lavender with an orange skirt going to grayish purple. The fourth woman wears dark blue-green with a dark orange belt. The fifth wears orange with a small piece of an ochre skirt visible below. The sixth woman is dressed in bluish gray over a pink skirt, followed by a woman wearing dark yellow-ochre. The eighth figure has a pink-lavender dress, tan at the chest, and with a tan belt. The last woman has a yellow mantle becoming blue-green, and wears a green dress with tan fringe over a gray-yellow skirt. The sky is blue-green becoming pink-orange behind blue-green mountains at the right. The ground and trees are dark greens and browns. PROVENANCE: The origins of this picture are not clear. It has been thought to be the picture that Cassiano dal Pozzo saw at Fontainebleau in 1625 and recognized as by Rosso.2 But it has also been related to a picture indicated as by Rosso offered by Giovanni Battista Crescenzi to the King of England supposedly around 1614 during the reign of James I.3 Villot, 1849, 142, no. 386, reported that the picture had been taken from Italy to Spain, and then belonged to Charles I of England. De Ricci, 1913, 121, no. 1486, recorded that the painting had been owned by the “marquis de Cresentius,” whom he identified as the architect of the King of Spain, and that Cresentius gave it to Lord Cottingham, who in turn gave it to Charles I (reigned 1625-1649). The documentation for this provenance is unknown to me, as is also the identification of the “marquis de Cresentius” with Giovanni Battista Crescenzi. Villot and De Ricci recorded that it was bought by Jabach for 117 pounds sterling at the sale of Charles I’s collection (according to De Ricci as recorded in the Louvre catalogue of 1757, 124, n. 5). There is a “Parnassus Mount” ascribed to Perino del Vaga from the collection of Charles I recorded as having been sold for 117 pounds to one Linchbeck on 19 April 1650 (Millar, 1972, 266). It would seem to have been a small picture as it was recorded as “in a case” (unless this means in a frame). This would seem to be the Louvre Pierides that in Le Brun’s inventory of 1683 is described as Le Montparnasse (see Engerand, 1899, 40). This would seem to offer the first indication of the English provenance of the picture, which, however, might go back no earlier than 1625 when Charles became king, but certainly before 1649, leaving open the possibility that it is the same picture that Dal Pozzo saw at Fontainebleau in 1625 and that is not recorded thereafter. This would mean that Crescenzi’s offer to the English King would have to have been after that date, that the offer was not taken, and that Lord Cottingham bought the picture instead. Villot and De Ricci stated that Mazarin acquired the picture from Jabach and that after Mazarin’s death (1661) his heirs sold the picture to Louis XIV in 1671. It is listed in Le Brun’s inventory of the king’s pictures of 1683 (no. 62). It appears in Bailly’s inventory of 1709 and 1710 (Engerand, 1899, 40-41) as at Versailles with an attribution to Perino del Vaga. See De Ricci and Engerand on its location at Versailles already in 1695, and on its subsequent locations to 1788. Chataignier and Niquet’s print (see below) indicates that it was in the Galerie Napoleon. Heinecken, I, 1778, 625, as attributed to Rosso, and to Perino del Vaga in France. Villot, 1849, 142, no. 386, with provenance, as by Perino del Vaga, but citing Mariette’s attribution to Rosso as recorded in Lépicié, Catalogue des tableaux du cabinet du roi, 1752, quoting Mariette’s Cabinet Crozat (1741) [see also Mariette, Abécedario, 1858-1859, 20]. Villot, 1854, 208-209, no. 369, as Rosso. Dimier, 1905, 18, Fig., 22, as Rosso, and perhaps painted for Francis I.
Gamba, 1910, 146, as by Rosso and painted in France. Goldschmidt, 1911, 22-23, 51, as Rosso, as the original of Caraglio’s print. De Ricci, 1913, 121, no. 1486, as Rosso. Voss, 1920, I, 189, as Rosso. Dimier, Histoire, 1925, 50, Pl. 35, as Rosso. Dimier, 1928, 9, as Rosso and painted for Francis I.
Kusenberg, 1931, 28-29, 128, Pl. 21, as Rosso, around 1525. Mez, 1932, 157, as a copy of a lost work by Rosso. Kusenberg, 1935, 62, as Rosso, around 1525. Becherucci, 1944 (1949), 29, as Rosso, in Rome. Barocchi, 1950, 89-92, 250, Figs. 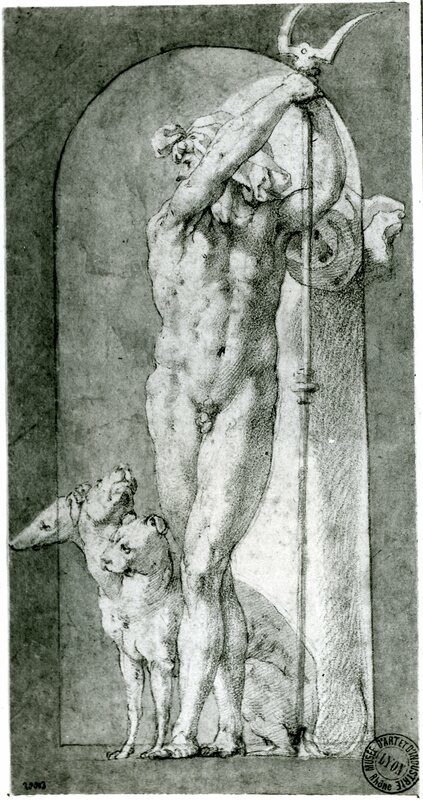 61, 63-64, as derived from Caraglio’s print and by a painter of the mid-sixteenth century educated under Primaticcio. Bologna and Causa, 1952, 27, no. 44, Pl. 42, as by an unknown French artist of the sixteenth century. Shearman, 1957, I, 247, 251-252, II, 231, n. 79, as Rosso. Béguin, 1960, 139, n. 21, as apparently a copy and reminding one of Thiry. Berenson, 1963, 195, as Rosso (?). Béguin, in EdF, 1972, 174, Fig., 175-176, no. 199, and Fontainebleau, 1973, I, 38, Fig. 2, II, 63-64, no. 199 (with extensive bibliography), as by Rosso, done in Rome, and engraved by Caraglio. Béguin, in Béguin, et al, 1972, 5, 10, Fig. 18 (color), 11, as by Rosso, and done in Rome. Cox-Rearick, 1972, 38-39, no. 45, with Fig., as by Rosso and done in Rome, and possibly brought to France by Rosso. Miles, 1973, 32, questioned the attribution to Rosso and thought Caraglio’s prints more faithful to Rosso. Mirimonde, 1973, 142, Fig. 1, 146-147, as derived from Caraglio’s engraving with mistakes in the rendering of the musical instruments that cannot be attributed to Rosso. Laskin, 1974, 261, Fig. 8, as Rosso, with a landscape that recalls Polidoro. Béguin, Louvre, 1982, 35-36, no. 26, with Fig., 56, as Rosso. Lévêque, 1984, 135, Color Pl., as Rosso. Béguin, in Ronsard, 1985, 58-59, no. 49, with Fig., as now generally accepted as by Rosso. Carroll, 1987, 94, n. 2, under no. 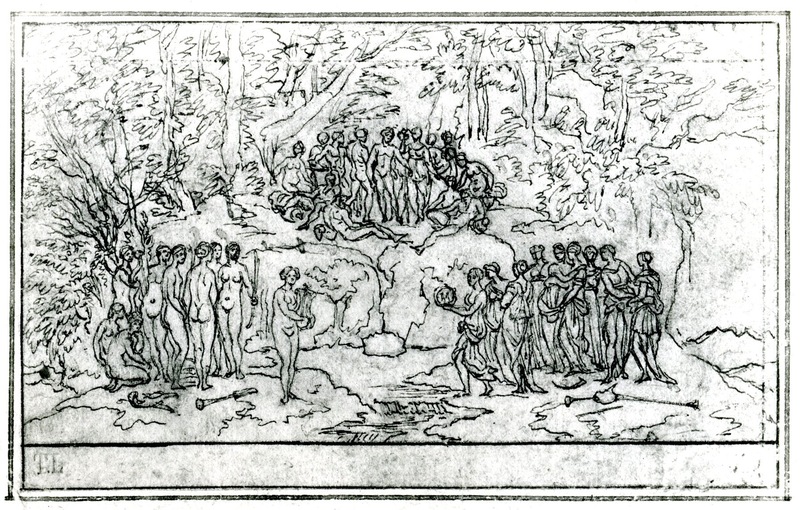 17, as not by Rosso and derived from Caraglio’s engraving. Massari, 1989, 141, as Rosso, according to Béguin, and in reverse of Caraglio’s print. Scailliérez, 1992, 17, 18, Fig. 12, as Rosso. Franklin, 1994, 285, n. 106, as not by Rosso. It is not clear when this picture first became related to Rosso but by 1741, after a period of having been ascribed to Perino del Vaga, Mariette recognized it as Rosso’s, most probably because of its relationship to Caraglio’s print and to Vasari’s remarks on the latter. 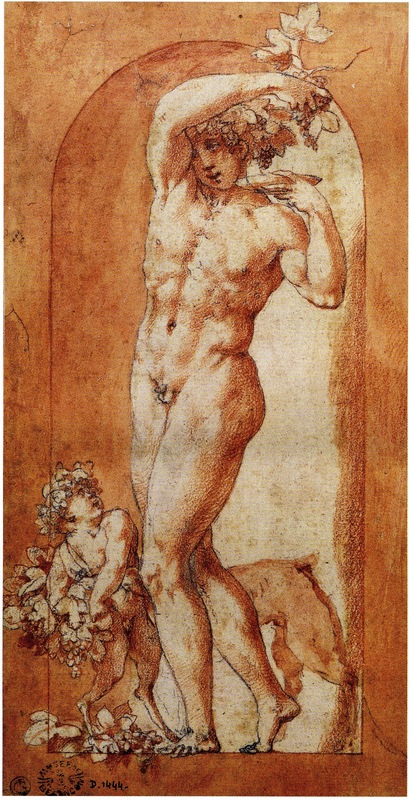 In his account of Caraglio’s printmaking after Rosso’s designs, Vasari said that Caraglio “condusse, pure col disegno del Rosso, la storia delle Piche.” There is no indication that Rosso made a painting of this story in Rome nor that Caraglio made any of his prints after paintings by Rosso. 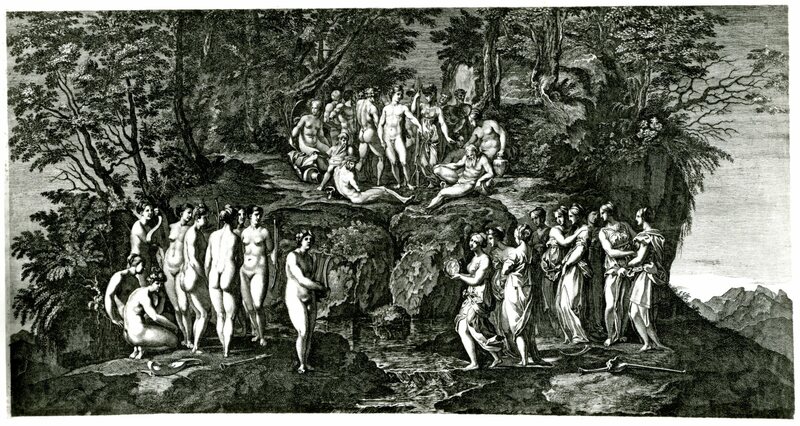 The evidence both of Vasari’s words and of the drawings that survive for the Gods in Niches of 1526 (Fig.D.17A; Fig.D17B; Fig.D.17C; Fig.D.18a) indicates that Rosso made only drawings from which Caraglio made extremely faithful engravings. The painting in the Louvre has a different format from Caraglio’s print; it is considerably wider and there is more ground at the bottom. The resulting greater amplitude of the space in the painting is quite unlike what appears in the print, and is quite unlike what appears in any of Rosso’s authentic works. The groups of figures have been more widely separated in the painting and the relationship of the landscape elements to the figures is not the same as in the print. The costumes of the Pierides are different in the painting, only the first woman having bare breasts, although this very figure has partially covered breasts in the print. The landscape has been much extended at left and right, and at the bottom where there is more land, and there is also a small waterfall that is not in the print. But the painting is also different in lacking and adding certain details that clearly indicate that the painter did not really understand the subject and the conception of the image. There are no birds in the painting, although birds are an essential part of the story, as the Pierides in losing the contest were turned into magpies. Furthermore, as Mirimonde pointed out, the instruments, archeologically “correct” in the print, have been ignorantly changed in the painting. Mirimonde rightly, it seems to me, could not recognize these changes as due to Rosso. The painting must follow from the print and be by someone who did not quite understand the meaning of what the engraving depicts. The small picture does have a certain exquisiteness and charm. But the elaboration of the landscape has no parallel in works by Rosso. The landscape bears a certain affinity with the landscapes of Niccolò dell’Abbate. 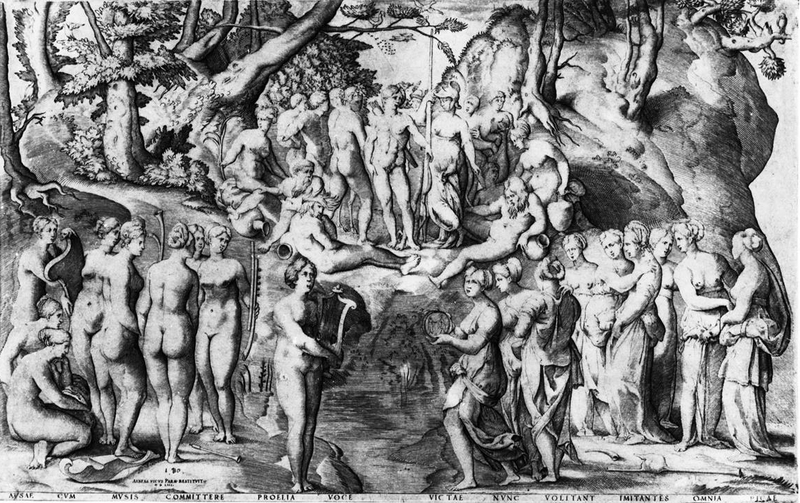 Some of the figures have a certain awkwardness, a regularity of form, and a strangeness of face that suggest that the painting may have been made not from Caraglio’s print but from an impression of the print made from the plate as reworked by Enea Vico in 1553 (Fig.E.110). I would think that the picture was done in France after Rosso’s death. COPIES, PAINTINGS: Louis Boullogne, copy made for Jabach, reported by André Félibien, Entretiens sur les vies et les ouvrages des plus excellents peintres anciens et modernes, Trêvoux, 1725, IV, 309. Massari, 1989, 141. Formerly, Collection of Desmond Fitzgerald, the Knight of Glyn, Ireland. Oil on panel, c. 10 x 24 inches. Exhibited at the Arcade Gallery, London, 1967, sold to Neuendorf, a German dealer? Mirimonde, 1973, 143, mentioned it as matching exactly Chauveau’s print after the Louvre picture (see below). Massari, 1989, 141. COPIES, DRAWINGS: London, British Museum, 1946-7-13-118 (Fig.RP.19, London, drawing). Pen and ink over red chalk, 7.2 x 11.4, the picture area: 6.5 x 11.4. Massari, 1989, 141. 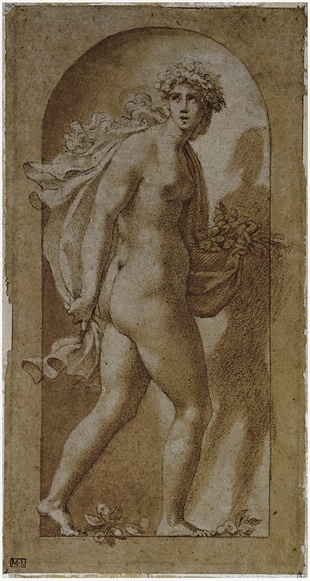 Derived from Chauveau’s print after the Louvre drawing (see below). Oxford, Christ Church, no. 1185 (Fig.RP.19, Oxford, drawing). Pen and black ink, brown wash, heightened in white (oxidized black and red in places) over very slight traces of black chalk, on tan prepared paper, 25.4 x 50. Inscribed in ink on the mount in Richardson’s hand, at the left: Nicola del’ Abate delin, at the right: d’appresso P. Perucino. LITERATURE: Mirimonde, 1973, 142, 143, as representing the Louvre picture and related to the painting exhibited at the Arcade Gallery (see above). Byam Shaw, 1976, I, 67, no. 127, as derived from the Louvre painting, hardly earlier than the middle of the seventeenth century, and stylistically reminiscent of Domenichino. Massari, 1989, 141. The drawing would seem to be copied from the Louvre painting with a few landscape details added, especially in the foreground, and not from a print of it. It is not derived from Chauveau’s print (see below) and would not be the model for it, which in certain details is closer to the painting. It is not related to the print by Chataignier and Niquet (see below). I do not know how it is related to Desnoyers’s print (see below). 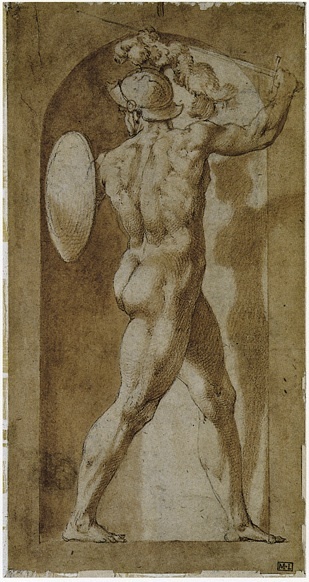 The detail of the drawing suggests that it was made as the model for a print. COPIES, PRINTS: François Chauveau (1613-1676), etching, 26.3 x 51.4, picture area (New York, 47.100.1110). COLLECTIONS: New York, 47.100.1110 and 59.505 (2), p.92. Paris. Vienna, Vol. H.B.IV, p.96, no. 104 (Fig.RP.19, Chauveau, Vienna). LITERATURE: Le Blanc, 1854-1888/90, II, 2, no. 119. Kusenberg, 1931, 163, as after the Louvre painting. Mirimonde, 1973, 142, 143, Fig. 3 (Paris), as representing the Louvre painting. A very careful copy of the painting. Alexis Chataignier (1772-1817) and Niquet. Etching, 10.4 x 19.7 L (London). Inscribed above: 692 PERIN DEL VAGA Eco.le Itali.ne and below: Dessiné par Girod. Gravé a l’Eau-fort par Chatataiger Terminé par Niquet LE COMBAT DES MUSES ET DES PIÉRIDES Gal Napoleon. COLLECTIONS: London, 1856-3-8-1159. Paris. LITERATURE: Villot, 1854, 208, under 369. De Ricci, 1913, 121, under 1486. Mirimonde, 1973, 142, 143, Fig. 4 (Paris). Less precise than Chauveau’s print. A. G. L. Desnoyers (Boucher-Desnoyers). Inscribed: Tableau du Musée Royal / 1829 le B.on Boucher-Desnoyers, A. G. L. B. France 1805 3. COLLECTION: Cambridge, Massachusetts, Harvard Art Museums, Fogg Museum. LITERATURE: Villot, 1854, 208, under 369. De Ricci, 1913, 121, under no. 1486. 1 On the history of its conservation, see Gilberte Émile-Mâle, “En marge de l’exposition de l’École de Fontainebleau: quelques documents inédits sur le rôle d’un artisan français, Robert Picault, dans la transposition du Défi des Piérides de Rosso du Musée du Louvre,” Bulletin de la Société de l’Histoire de l’Art Français, 1973, 33-36. 2 In 1625 Cassiano del Pozzo saw in the Cabinet des Peintures at Fontainebleau “…un quadretto, un po bislong, nel quale è una Disputa fra le Muse e l’altre sorelle che da esse furon converite in gazzere,…” which he said was by Rosso (Pozzo-Müntz, 1886, 268; Kusenberg, 1931, 102, 201, n. 232). This report has been associated with the small picture in the Louvre. The provenance of the Louvre painting does not place it at Fontainebleau early in the seventeenth century but there is confusion here and it could, nevertheless, have been the picture Del Pozzo saw. But he may have seen another painting. Sainsbury dated this list “? about 1614” in which case “his Majesty” to whom the pictures were offered for sale in a paragraph following the list was James I. Shearman, 1965, II, 217, under Cat. no. 32, identified the seller as the Roman Conte Giovanni Battista Crescenzi, who was either the owner of the listed pictures or an intermediary. The title and attribution of the painting suggest that it is related to Caraglio’s engraving and this reference to it has been given as part of the provenance of the small painting in the Louvre, which has also been related to the picture that Cassiano del Pozzo saw at Fontainebleau in 1625. It is unlikely that the picture offered to the king was actually by Rosso. It is also unclear that it was the same picture that was at Fontainebleau in 1625.